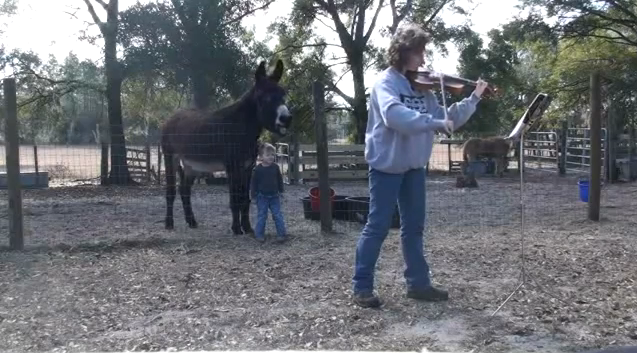 4 Donks and everyone, click on the image below to see a youtube of Donkeyotee, a singing donkey. He was a rescue and loves to sing! Brandi Too funny. Maybe 4Donks should see if any of her donks have any singing ability like the one in the video. Long night, my friend Dennis' mother is in ICU following emergency surgery for a bowl obstruction. Apparently old scar tissue. The bowl had started to die. Prayers please for Louise and the family. Brandi love it. I am lucky enough to have a full choir. Sister I will add her to my prayer list. Have you heard about the biopsy results ? Thank you 4Donks. No, I haven't heard yet from my biopsy. Trying to think positive thoughts. Thank you for asking. Sister, I am sorry I didn't see this until tonight, but my prayers are with Louise and Dennis and you. Hi Cookie, hope all is well with you and you are staying warm. Sister, prayers for the results being good. Prayers and love to my monkeys, I am so tired today. Hoping that you are all doing well. This has actually been happening for quite a while. i have a friend that is ex military intelligence that told me about drones over the US about a year ago. He also said that preparations are being made for martial law (i e making LEO look more and more like military) and for camps to hold "insurgents" in the USA. I guess paying my mortgage is not such a big deal since I am pretty sure i have first dibs on a room being a libertarian, TEA party, gun toting Ron Paul supporter who believes in God . . . .
Actually, the scariest thing is that the government is likely going to round up all the state subsidized people and they will be in the camps - with the kids that had no choice. Page created in 7.583 seconds with 19 queries.